Look, I’m not a big fish lover, though I’ve got to tell you some of the fine fish dishes we’ve been served up have radically changed my gut reaction to those scaly creatures. We’ve had great sushi, fish that didn’t taste like fish, fish that didn’t look nor taste like fish and fish that tasted like fish but was so well prepared, we didn’t seem to mind; in fact we kept being surprised. Would I go out and buy them, during the Nine Days? Maybe, but otherwise, not so much; even if the stats on fish being a heart healthy, stroke and Alzheimer’s preventative food, are definitely very convincing. So, in keeping with with the season (and in lieu of meat), I thought I’d share a few tips learned along the way about preparing a good fish entrée. When you’re at the store pick a fish that’s firm doesn’t smell fishy, but fresh like it just came out of the sea; not that I’ve had first encounters with what that smells like. If you’re buying a whole fish, the color should still be vibrant, the eyes not dulled nor opaqued. Cook it right away or freeze it, but don’t fridge it for more than a day. When preparing a milchige meal, my mother always soaked the fish in milk for a while; she claimed it got rid of any fishy taste. 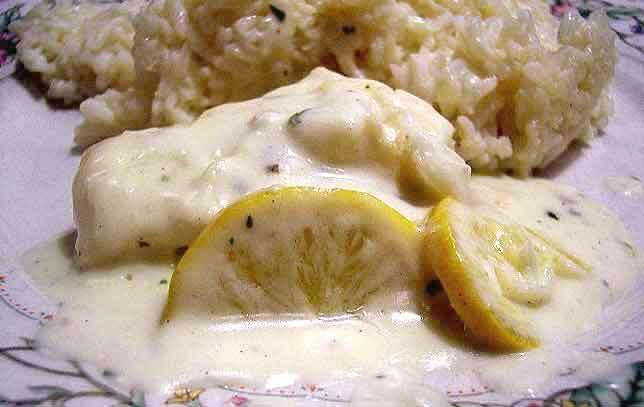 Marinades are wonderful; just don’t leave the fish in an acidic based marinades for more than 30-60 minutes. Simple marinades work great! Try olive oil mixed with fresh lemon juice, add a little pepper, some fresh parsley or dill, thyme or basil and voilà, fantastic! Add a teriyaki sauce or mix a small finely chopped onion, 1 minced garlic clove, 1/2 cup light soy sauce, 1/4 cup water, 2 tablespoons brown sugar, 1/4 teaspoon black pepper, 1 tbsp fresh ginger, zest of a lemon or lime, add some Tabasco or crushed hot pepper if you like it hot, (works great on salmon, but then practically everything does!). If you like a cooler taste, try poached salmon with cucumber dill sauce. 1 c. chopped or shredded peeled and seeded cucumber, 1/2 c. yogurt or sour cream,1/2 c. mayonnaise (low fat mayo works), 1 tbsp vinegar or lemon juice,1 tbsp. minced parsley,1 tbsp. dill, salt and pepper to taste. (covers 4-5 medium fish filets). Mayo-ketchup – 1 part ketchup to two parts mayo, garlic powder to taste. Tartar mayo – 1/2 cup Mayonnaise,2 tbsp sweet pickle relish, 1 tablespoon lemon juice, 1/2 teaspoon chopped parsley, 1 tbsp chopped chives. Personally, I like my fish baked or pan seared with a few drops of olive oil, a clove of garlic, and a couple good squeezes of fresh lemon. Fish is versatile and porous so it doesn’t take much for it to absorb surrounding flavors. Poached, baked or fried, don’t overcook your fish. Take it off the flame or remove from the oven when it’s mostly done; it will continue to cook till it cools. What makes a fish kosher? Check it out here, or you can find a listing of kosher fish here. For those who suffer on these strictly milchig or pareve days… remember that is the point of the whole thing. Pray for Shabbos, join a siyum, but mostly daven for a true yeshuah when we will be zocheh to flip me’evel l’yomtov, bimhera biyamenu, amen! . Finally I found a recipe for a pareve potato bread. I always wanted to taste potato bread! The recipe for this delicious, light bread came from Elizabeth David’s English Bread and Yeast Cookery. Browsing through that book is a pleasure. I start reading for fun, absorbed in food history, almost hearing Ms. David’s distinctive, elegantly British voice, and then hit the recipes. Oh, those crumpets and muffins, those brioches and yeast buns! Every time I go through it, another recipe catches my eye. This time, it was potato bread. Ms. David took old recipes and adjusted them to her modern English kitchen. Here in Israel, I took this recipe and did the same. One of the adjustments I made was to keep this loaf pareve (containing neither meat nor milk). Ms. David suggests using a mixture of warm milk and water for the liquid. Note: there is no fat nor commercial sugar in this bread. Salt: 20 grm. or 2 tsp. Warm, dry, mashed and sieved potato: 120 grm or 1/2 cup, firmly packed. One medium-sized potato should do it. Yeast from fresh cube: 15 grm. or 1 Tblsp. 1. Boil the potato, in its skin, till it’s quite soft, but not disintegrating. 2. While the potato is cooking, put the yeast in a small bowl with the warm water. Allow it to dissolve. 3. Measure 3 cups of flour into a bowl and add the salt to it. 4. When the potato is done, drain it and bring the cooking pot back to the stove, shaking it over the flame to dry it out well. Remove the potato to a dish and let it cool just enough to handle. I didn’t peel my potato, but if you want to, go ahead. Mash it and force it through a sieve to eliminate lumps in the dough. 6. Make a well in the center of the potatoey flour and pour the yeasty water in. With a spoon, throw flour from the sides over the liquid and mix it in. 8. Knock it back and sprinkle in, a little at a time, another 1/2 cup of flour. Lightly knead, or fold and stretch the dough till it’s a cohesive mass. Cover the dough with a damp towel and let it rest for 15 minutes. Both of these parts are important: you let the dough rest to absorb the new quantity of flour, and the damp towel is there to keep the top crust a little moisturized lest you get a crust too hard to cut. Preheat the oven to 425° F 225° C.
9. While the oven is heating, shape the dough into a loaf. You can place it into a loaf tin or leave it free-form. 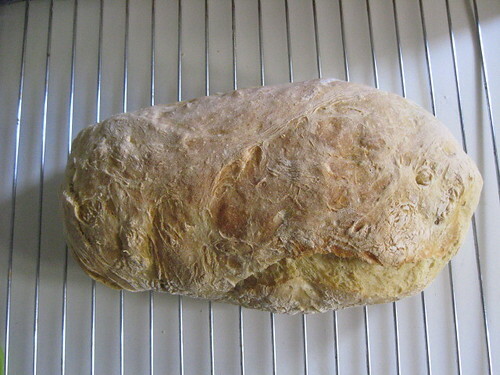 What I did was shape the loaf on a floured sheet of baking paper and roll the paper back and forth a few times under it. The normally bottom, seam side stayed up on purpose to let the loaf open along the seam – instead of slashing the loaf on the top side. Let the loaf rise till light – again, covered with a damp towel – another 20 minutes or so. 10. Spritz, or brush the loaf with water. 11. Bake it for 45 minutes. Cool on a rack. Wait till the bread is entirely cool before slicing into it. In fact, it’s better the next day. Good to eat plain or toasted; good for sandwiches; good for croutons. Just darned good bread. [Photo by Mimi from www.israelikitchen.com]. The taste was super delicious, the aroma as it was baking and as it come out of the oven… ahhh… The above quoted blog is further proof you need not be a professionally trained chef, with years of experience, to create delectable food!